WW1 aviation history has been my hobby for 50 years. Over that span, I have devoted a few thousand hours to the study of Manfred von Richthofen and his all-too-short flying career. Daniel Orme comes at MvR's last flight from the viewpoint of his profession as a clinical psychologist. As if his view is new. It is not. I know of three instances when MvR disobeyed Idflieg orders. (Idflieg was the German Air Force's high command.) First, when he was ordered not to exceed Oswald Boelcke's total of kills. Second, when he was ordered not to fly anymore after receiving the Pour le Merite from the Kaiser himself. And third, when he was ordered not to fly anymore after his wounding. So the DNIF that Mr Orme suggested was given. MvR disobeyed. His reputation was such that he got away with insubordination and disobedience. Was MvR still a good fighter pilot? I think so. The day before he shot down two enemy aircraft, including Richard Raymond-Barker, a British ace. The Fokker MvR flew that day was new to him. He had less than a week in it. Did MvR suffer from PTSD? All the evidence says he did. MvR's behavior changed after he was wounded 06 July 1917. Did MvR's PTSD affect his decisions in the air? Perhaps. There is no way to know for sure. 1. The wind was from the east. Usually the wind blew from the west. This favored the Germans. The east wind that day favored the English. 2. 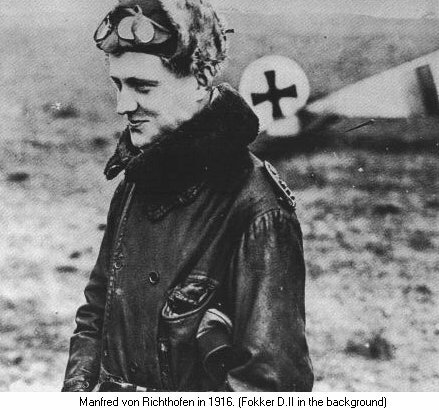 This flight was Wolfram von Richthofen's first into combat. Wolfram was MvR young cousin. In all the time I have studied MvR, only two accounts mention Wolfram. Wilfrid May got on Wolfram's tail and shot him up but did not kill him. MvR saw this and flew to Wolfram's defense. MvR was in a fury because his young cousin was at risk. He judged that shooting at Wolfram was a capital offense and he meant to execute judgment on May. That is why he chased May over British lines and continued the chase even after one gun jammed. He became target fixated and paid the price. I note that MvR chased May for several minutes. That is, his lapse of judgment was not momentary. It was deliberate. This is unique in WW1 aviation. No other pilot received a postmortem examination. The bullet's path says the lethal shot did not come from Arthur Roy Brown's guns.